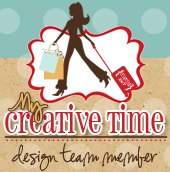 Welcome to the My Creative Time July Release Bog Hop!!!! If you came from Micia's blog you are in the right place! Have you been playing the "I SPY" release game with us??? It has been so much fun having everyone guess what stamps and dies we have been using in our projects! Don't forget to check out Emma's store for the new release! For todays project, I made this awesome Recipe book using the Stitched 4 by 6 Journal Die...How super cute right! It was easy to put together. I just sandwiched two cards and made pockets out of them. I then used my cinch to bind the book. It was quick and easy! These would be great to make as gifts for someone special! Up next is the talented Miss Nikki! Thank you for stopping by today and joining us for this release! Make sure you check out the rest of my scrappy sisters for a chance to win! Big crafty hugs to you all! So adorable!!! You are awesome at adding all of the perfect details, Nancy! How cute! I need to do two of these for my daughters! Great idea!! I love your recipe book!! I spy the stitched tab die! your recipe book is great and nice way of using those awesome dies. Cute, cute, cute!!! Great idea and great papers. What a fabulous gift this would make - I like the bright cheery colors. What a fantastic album! Beautiful! Your creativity and the new MCT release = perfect match! Thanks for sharing and inspiring! FABULOUS!!! Love your recipe book! Awesome recipe book! Love this idea, thank you for sharing! That's a great recipe book! That would make great Christmas gifts! Wow!! That is gorgeous!! Great job on everything with this release!! This is fabulous! I love your project!! Oh my goodness!!! Love your recipe book!! Love all the colors and different elements you used. This is such a wonderful idea. Love it. TFS. OMG what a great recipe book you really did come up with a fantastic idea. WOWIE WOW love your colors and embellishments Just love it!! This is so sweet! Lovedyour idea of using this die for a little recipe book! OMG!!! This is AWESOME Miss Nancy!!! I EXTRA LOVE it! What a fabulous way to use this die! This would be an awesome gift to make or receive! Love this idea. Absolutely love the way you mixed colors and patterns-'very pretty! Love this idea and I love the way you did the hinge! Thanks for the inspiration. Can't wait for my order to arrive! Totally awesome project using the 4x6 Journaling die and Stitched Tab. When I get back down to Florida in the fall and I'm reunited with my Zutter and the same paper pad you used, I'm going to make one of these. Great inspiration. Wonderful job on your book. I could not help thinking it could hold all of the pictures of family dinners, restaurant pictures, the kids making a mess when they were little...it might be a fun album. You are awesome at mixing colors, prints and textures. The ribbons on tags, the cover design and the big bow are beautiful. Great work! Great recipe book! Just love how it turned out! Thanks for sharing. Great idea! Your recipe book looks terrific. TFS your creative project. I'm good to have to give in & buy the journal dies, tag dies, the tabs, & well everything else! I have the same stack of paper that you used & have been waningt to make my mom & my Aunt a recipe book for their moms recipes! Great book! Would be a great Christmas present! How fun is this!!! LOVE the beautiful papers and all the FAB stamps and dies you used!! Such a GREAT gift idea!!!! Thanks for sharing and I have had a blast being a Guest Designer with you for the new release!!! Sooooo cute love the fun little recipe album. That is just darling. Great job. Absolutely adorable!!!! What a great choice of dies and colors! I love, love, love this beautiful recipe book! I have been wanting to make them for my daughters and granddaughter. I may have to "borrow" your ideas. Oh I love it, I like you idea of the mini album, thanks for sharing. Your recipe book is awesome, what a great idea. Great job with the recipe book idea. Your recipe "smash" book is absolutely wonderful! Would make a wonderful gift for a new home! Thanks so much for sharing your inspirational project! What a fabulous recipe smash! Thank you for this mini recipe book idea! It's a perfect place to share some special recipes combined with a little journaling. Oh, this is too sweet for words!!!! Love this sooo much. How wonderful is that great big huge bow on the front?? ?